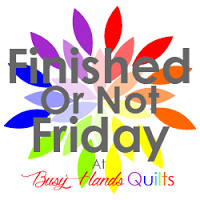 Today's finish is the last project of my Finish Along Q3 goals. I've played along successfully for three quarters this year. It's a great way to stay focused on WIPs. I started piecing Notched back here in March, and I had a finished top here in April. And now a finished baby quilt measuring 36-inches square. I procrastinated so long in quilting this because I didn't know how to quilt it. 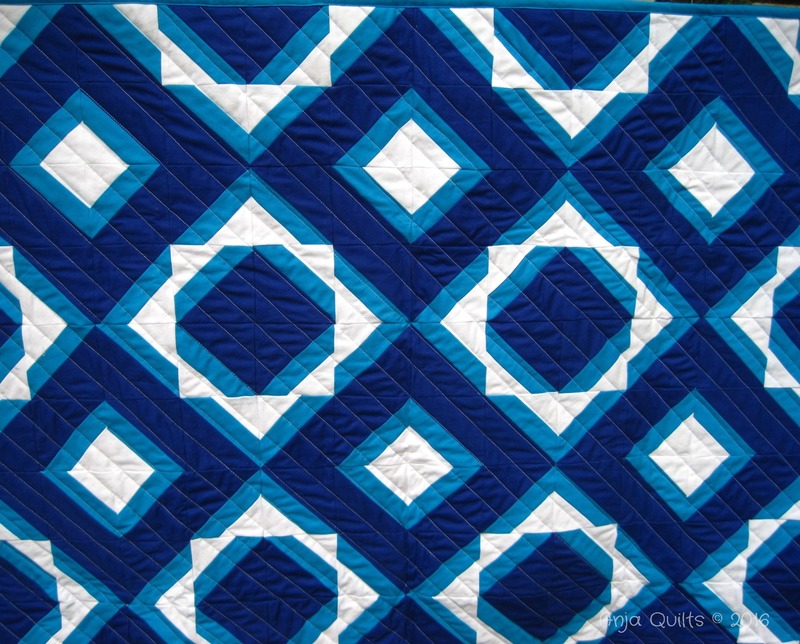 I didn't want the quilting to detract from the awesome pattern. Dena @ No Frickin' Blog Yet (will you just create a blog already) suggested diagonal quilting. Success! This is a great pattern by Yvonne @ Quilting Jetgirl. You can find her tutorial here. 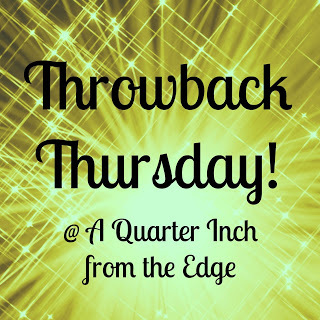 I found this backing at my LQS. I'm so glad I bought it in a few colours. I'm slowly making my way through many WIPs. I'm going to get on top of them someday...but not this weekend. 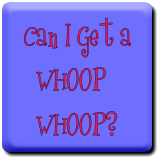 I'm off to a wedding out of town on Saturday, and then walking/running a quarter marathon (10.5K) race on Sunday. Still debating whether my mind and my body are both ready for my first 10K. Starting next week, I'll be teaching a four-week quilt class at my LQS. Yikes! 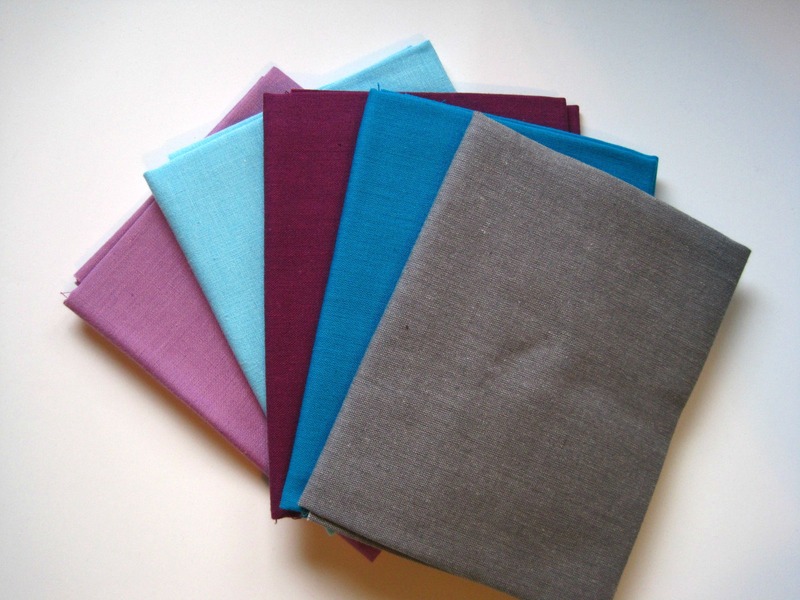 Atlantic Fabrics is a family-owned business with six locations in Nova Scotia. 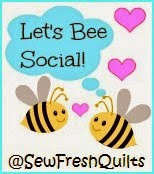 I would say the store is about 50/50 craft supplies and fabric. The classes they have offered over the years have been traditional, but they want to start offering modern classes. 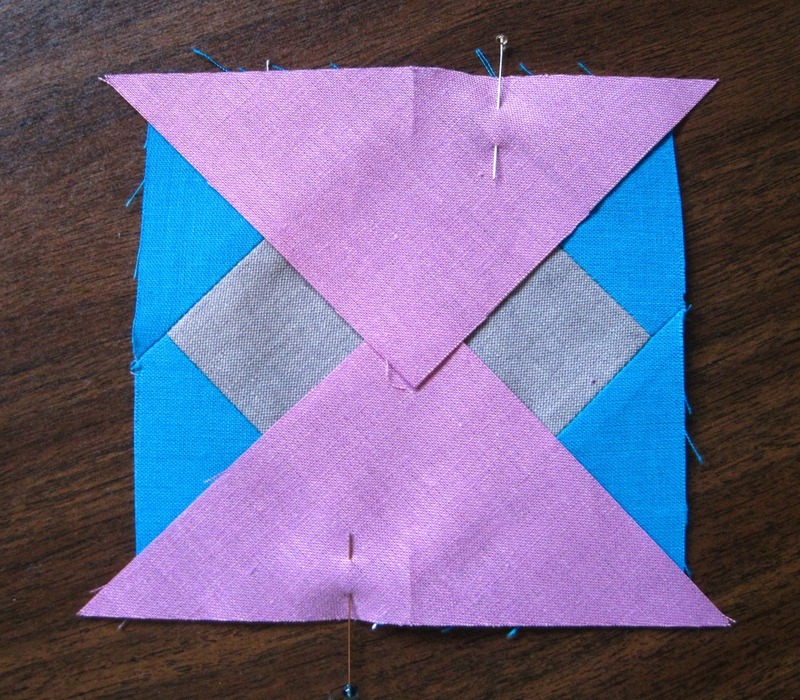 So as a start, I'll be teaching a simple Plus baby quilt. So far there are five registered for the class. 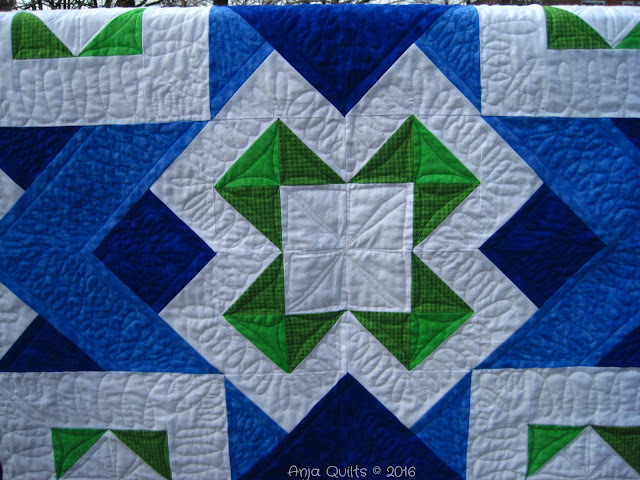 I'll be teaching rotary cutting and chain piecing methods during the class. 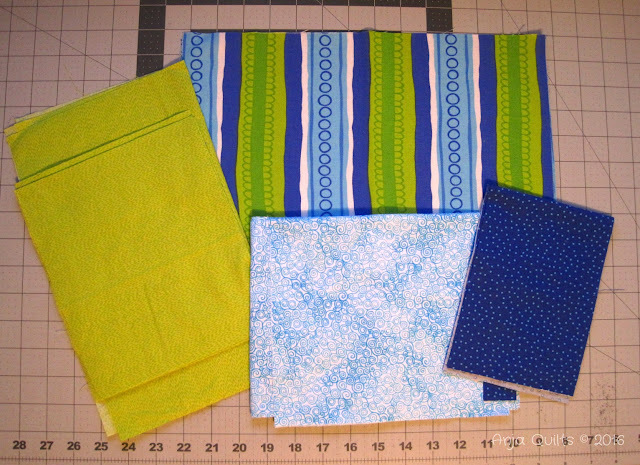 Two of my current WIP's are two bags that I hope to get finished during the Bag It 2016 quilt along hosted by Patty at Elm Street Quilts. 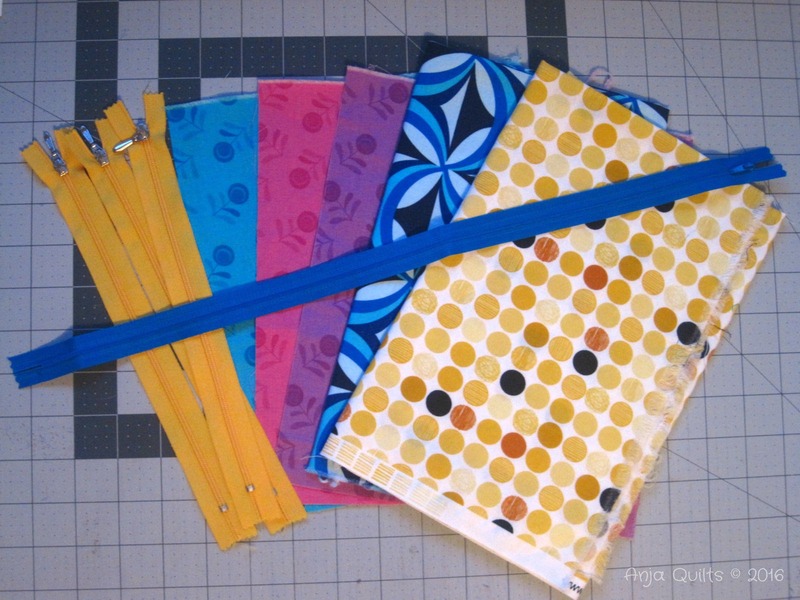 I have fabric chosen to make another Sew Together Bag. You can read about my first one here. 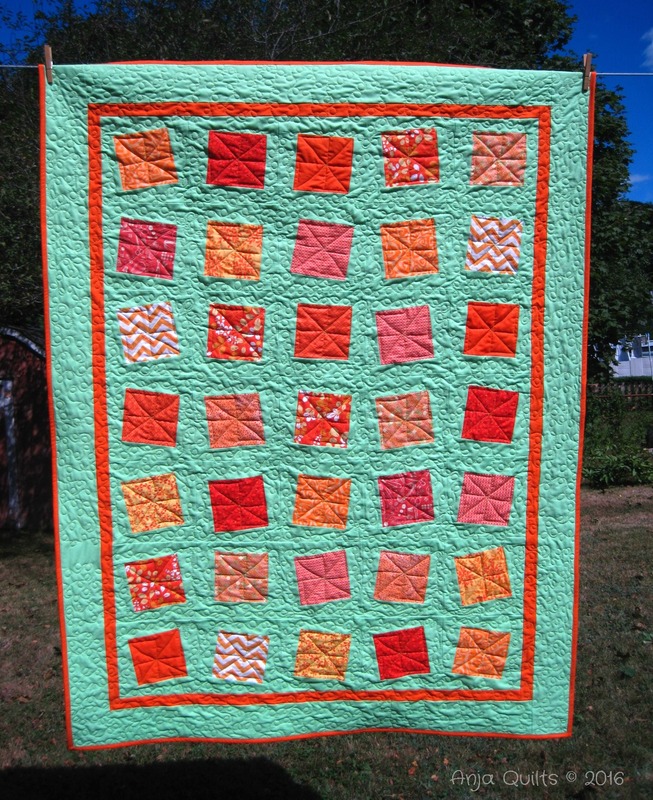 If you decide to sew one, make sure you follow the tutorial over at The Quilt Barn. And I finally decided on fabric for a Maker's Tote by Anna @ Noodlehead. Here is what it's supposed to look like. 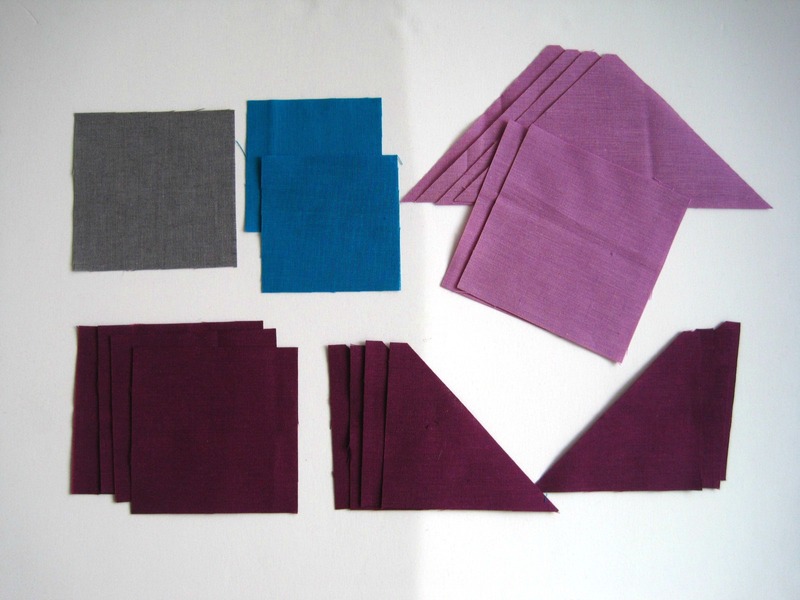 I'm hoping I can take the fabrics below and sew them into a something that resembles the above. 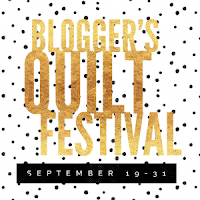 Amy at Amy's Creative Side is once again hosting Blogger's Quilt Festival. 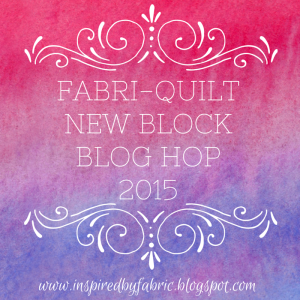 It's a great opportunity for bloggers to share their work and to be inspired by others. I am going to enter the Home Machine Quilted Category (for quilts that have been quilted on a domestic machine). Ocean Sky is a pattern created by Brianna @ The Iron and Needle. You read about my journey here. All the fabrics were in my stash. 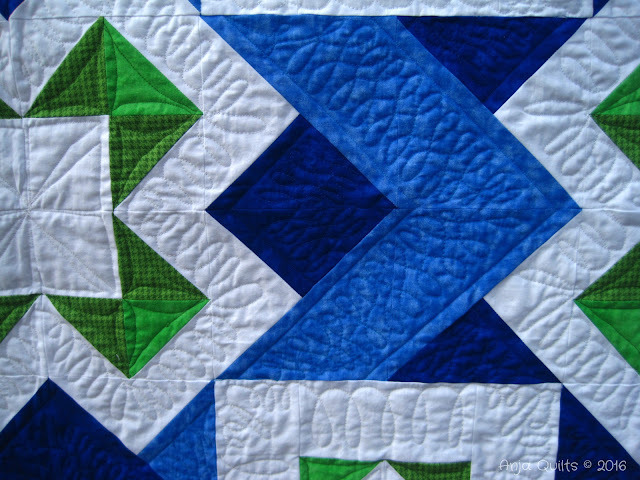 I love how well blue and green play together. 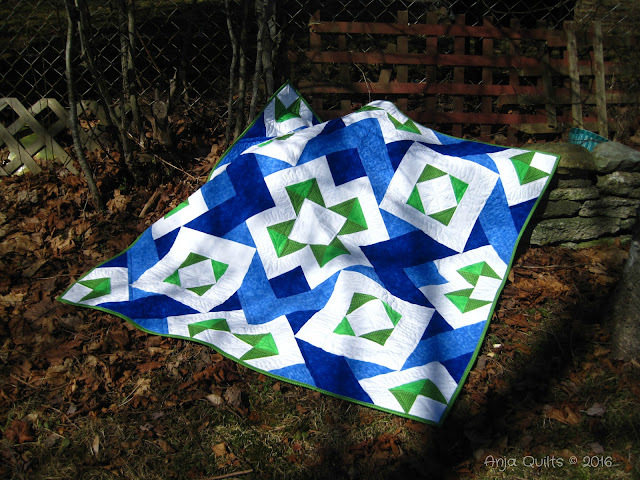 I felt this quilt needed some special quilting and not just an all-around motif. 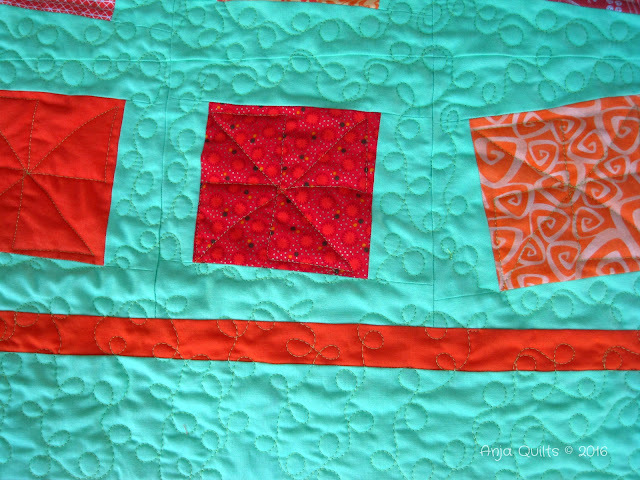 But...I am not very good with free motion quilting on my Singer, and she does not like it very much. 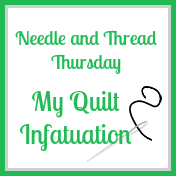 However, Sandra @ Musings of a Menopausal Melon gave me some suggestions, and I tried some new things. 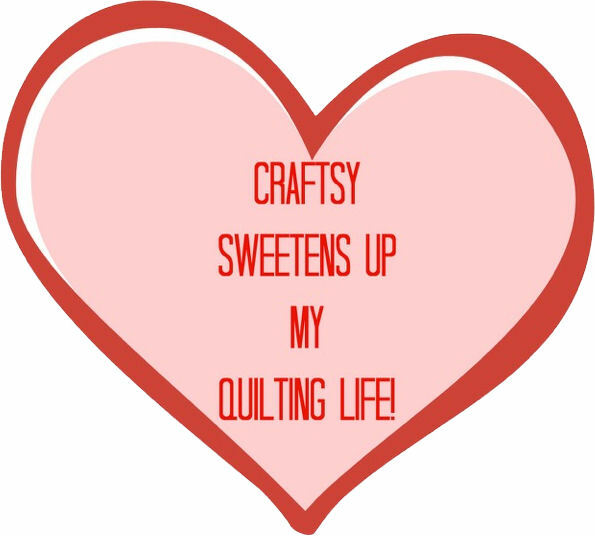 There are many times when I've wished for a fancy, electronic quilting sewing machine, but in all honesty, I love my little Singer. She's sturdy (aka heavy), and she's never let me down. I think the wishbone motif is my favourite. I need to try it again. I encourage you to head over to Blogger's Quilt Festival to see all the wonderful quilts and to vote. 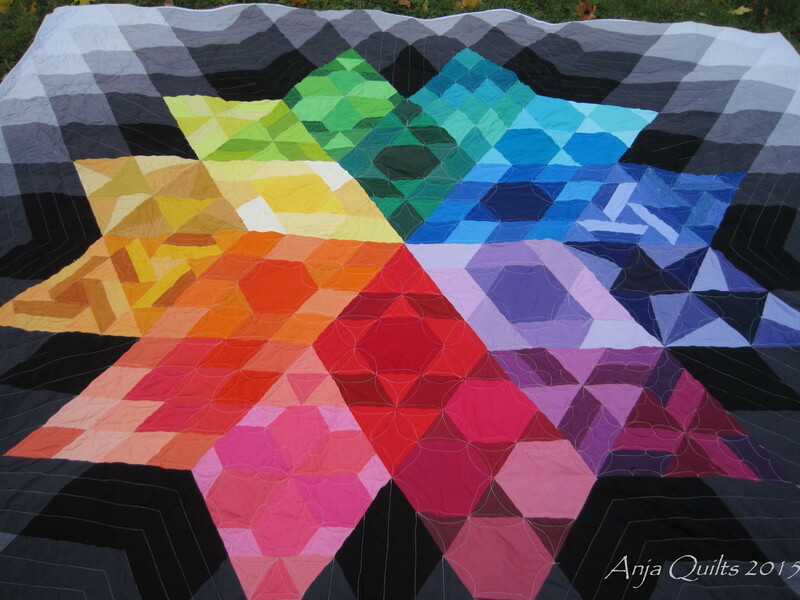 I am going to enter my Gravity quilt in the Large Quilt Category (for quilts measuring 241 inches or more all around). 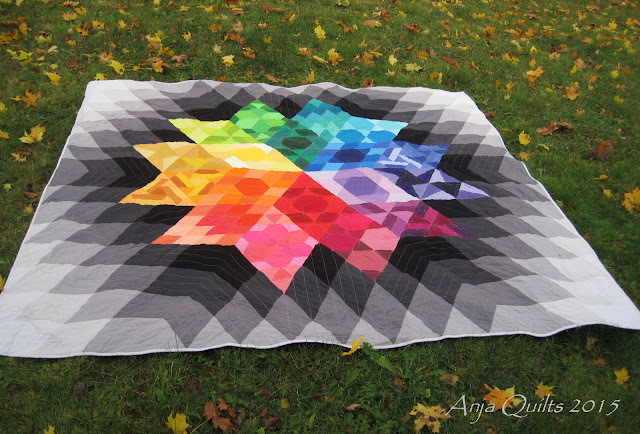 Measuring approximately 388 inches, she's the biggest quilt I've ever made. It was a great way to end 2015. I made Gravity by following a QAL hosted by Myra @ Busy Hands Quilts. You can read about my journey of making Gravity here. I tried a new quilting motif. My curves are not perfect, but I'm pleased with how it turned out. Gravity makes me happy and lives on my bed. 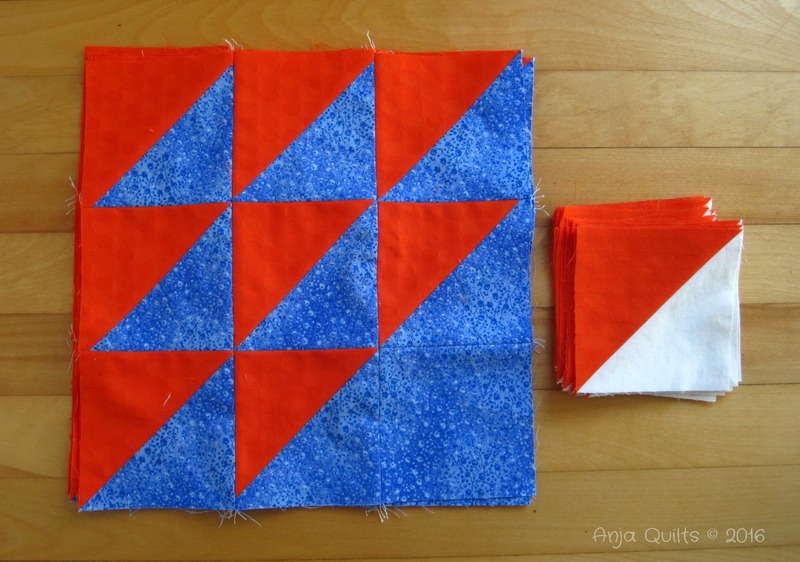 I'm playing along with #100Blocks100Days hosted by Angie @ Gnome Angel on Instagram. You can get the details here. We are making all 100 of the 6.5-inch blocks in Tula Pink's book 100 Modern Quilt Blocks. 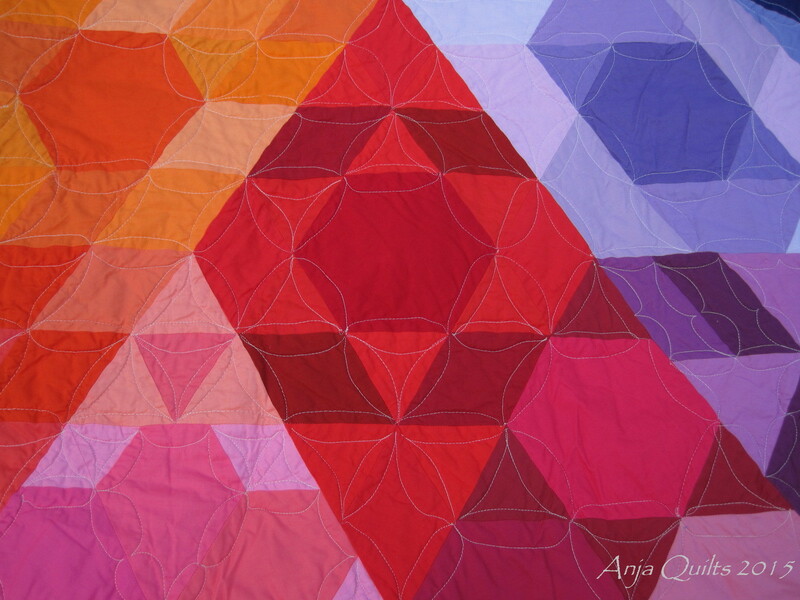 You can follow my progress on Instagram @AnjaQuilts. We are a little more than halfway through the 100 blocks, having completed 35 blocks. I'm getting a little stressed with all the 1-inch and 1.5-inch pieces. Where are the bigger pieces????? I didn't (and still don't) have a plan with respect to colour scheme -- I'm just working my way through my scraps. 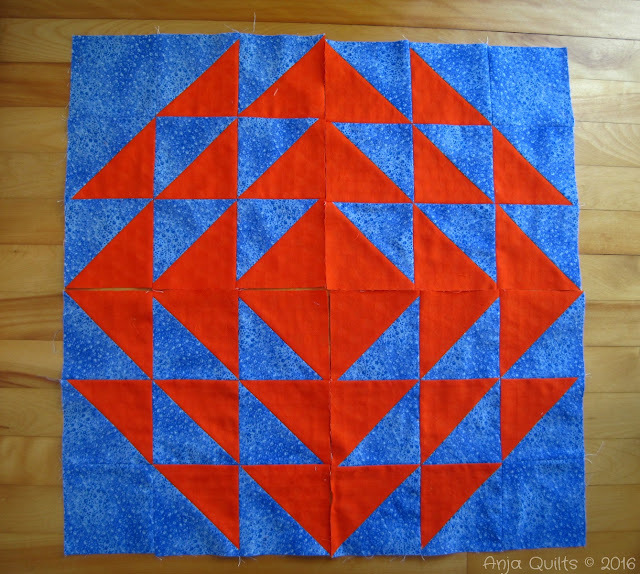 I will likely have to put sashing between the blocks when I'm finished as I have quite the mish mash of colours and prints. Another finish for my Finish Along 2016 Q3 goals. I've got two more weeks to finish the sixth and final project. 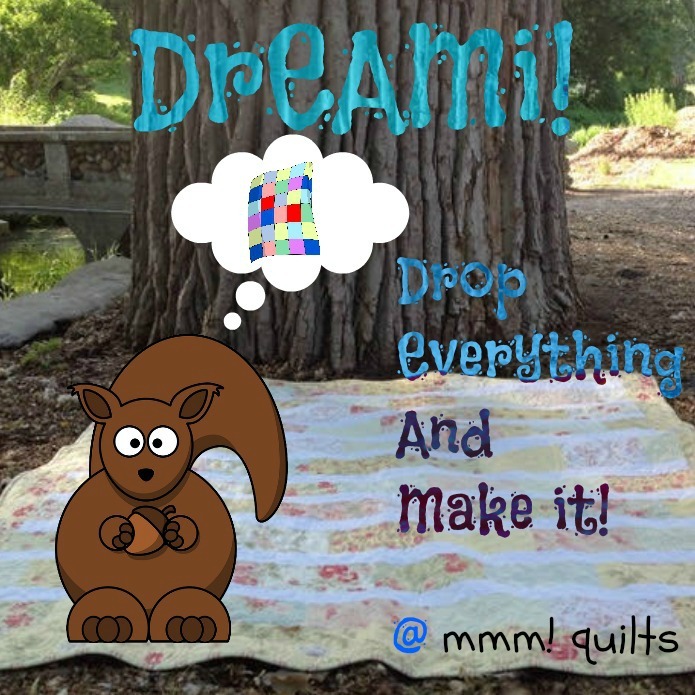 I need to make a decision on the quilting and get moving. 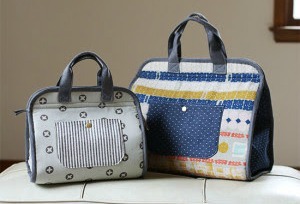 This is a great tutorial by Jayne @ Twiggy and Opal. 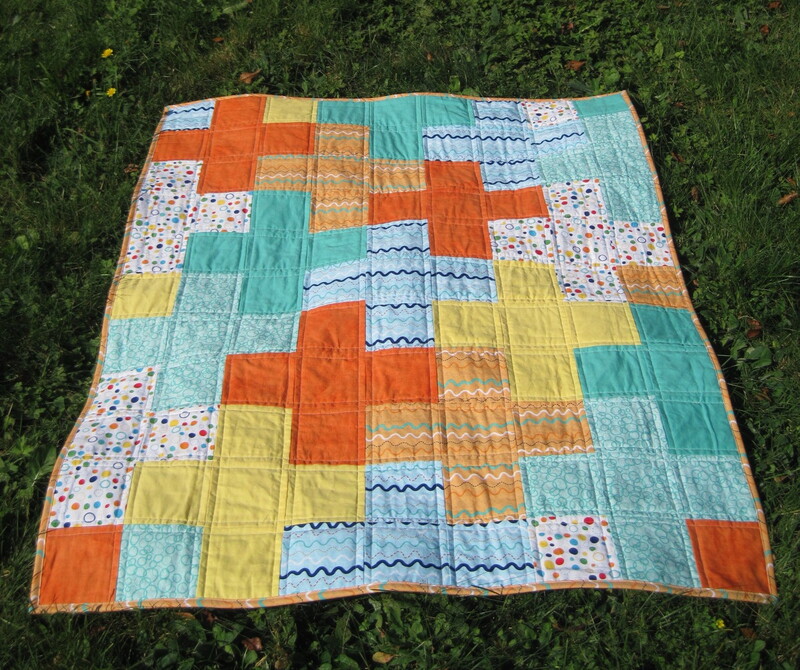 I'm going to keep this, but you probably already guessed that from all the orange (and yes, the backing is orange). 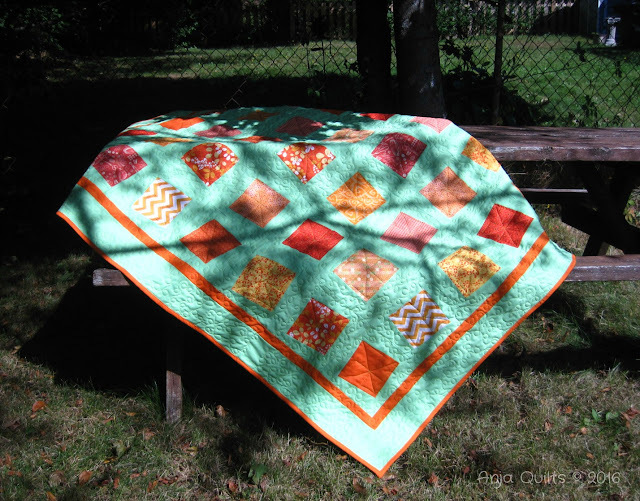 It's hard to capture the true colours, but that's Kona Pear and Kumquat. 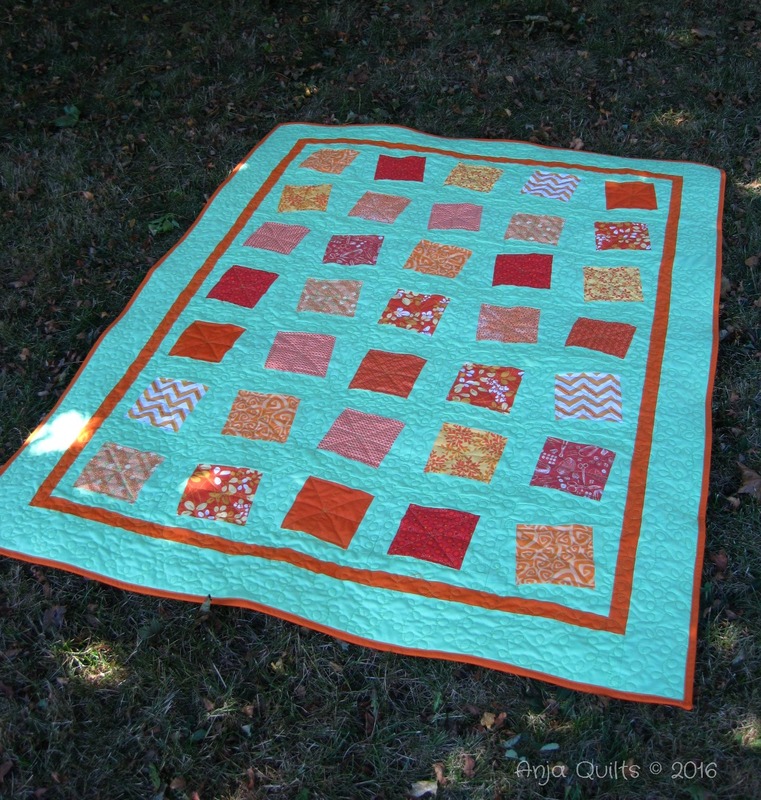 I attempted to free motion quilt pinwheels in all the orange squares. They definitely did not turn out how I envisioned. Definitely need more practice. We have had little rain this summer, so the poor grass is suffering greatly, which doesn't make for great photos. Will you be spending the weekend quilting? Unfortunately, I won't have time. I have a 5K sunset race tonight and then a 5K sunrise race in the morning. And then off to an all-day Girl Guide training. I predict a nap in my future for Sunday. 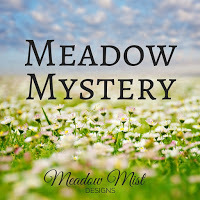 Cheryl @ Meadow Mist Designs is hosting another mystery QAL -- Meadow Mystery. It's not too late to join in on the fun. We've only just begun piecing. 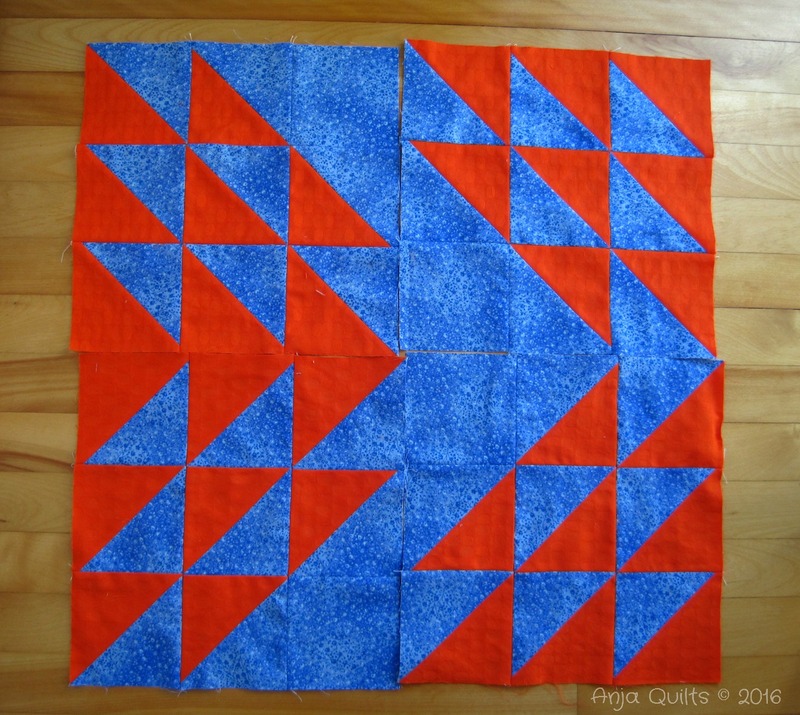 The first piecing steps were HST's and four blocks. 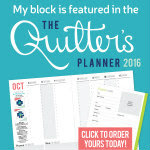 I love that how Cheryl has broken down the sewing into manageable monthly steps. 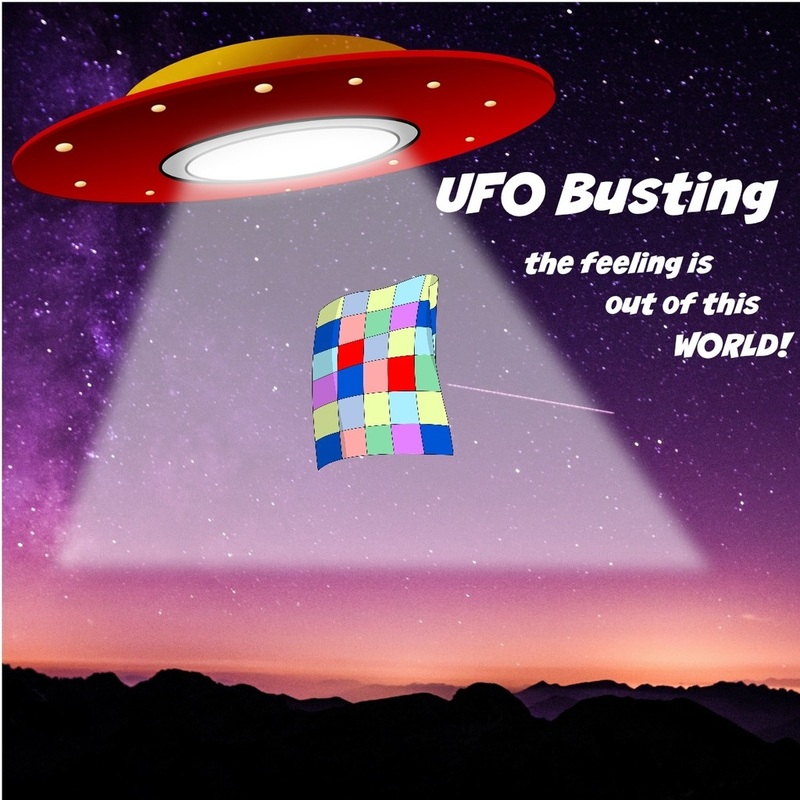 It definitely keeps you in suspense as to the final design. I thought I'd play around and lay out the blocks in various designs. This reminds me of the CBC logo. This is different, but interesting. Now to wait for October's instructions. 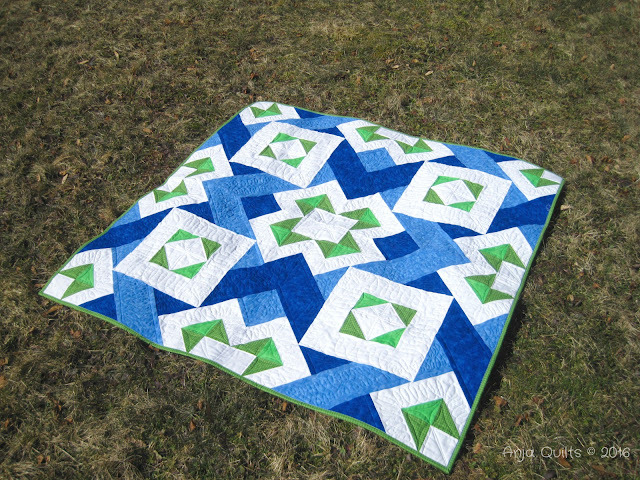 Through my participation in the New Quilt Bloggers Blog Hop that was hosted by Stephanie @ Late Night Quilter, Cheryl @ Meadow Mist Designs, and Yvonne @ Quilting Jetgirl, I had the opportunity to create a 12.5 inch block design. 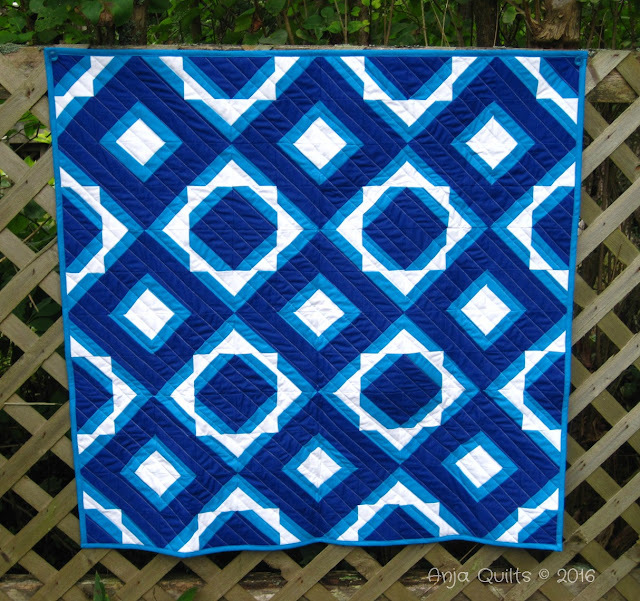 Cloud9 generously sponsored this blog hop featuring their Organic Cirrus Solids. All participants received a fat quarter of five solids. 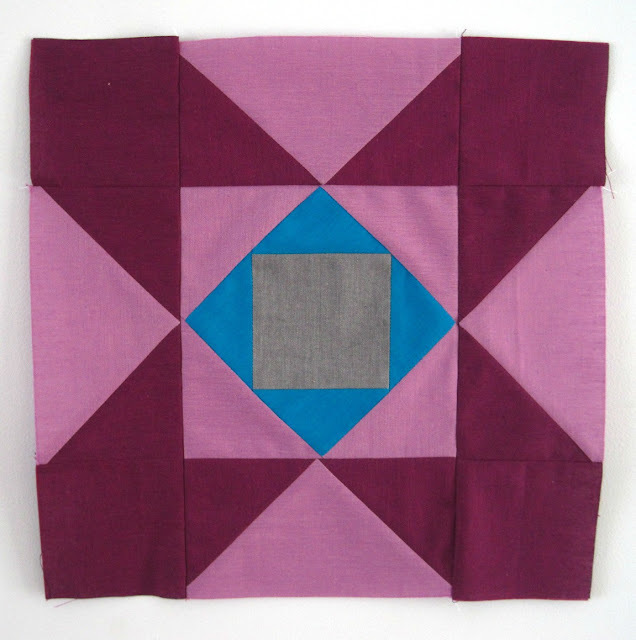 Here is the block I designed. 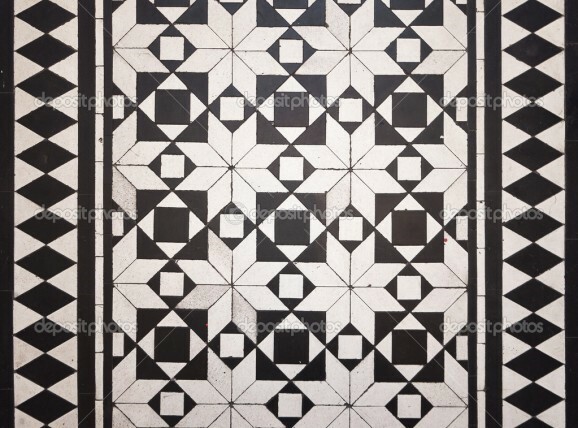 The design was based on this floor tile I found online. 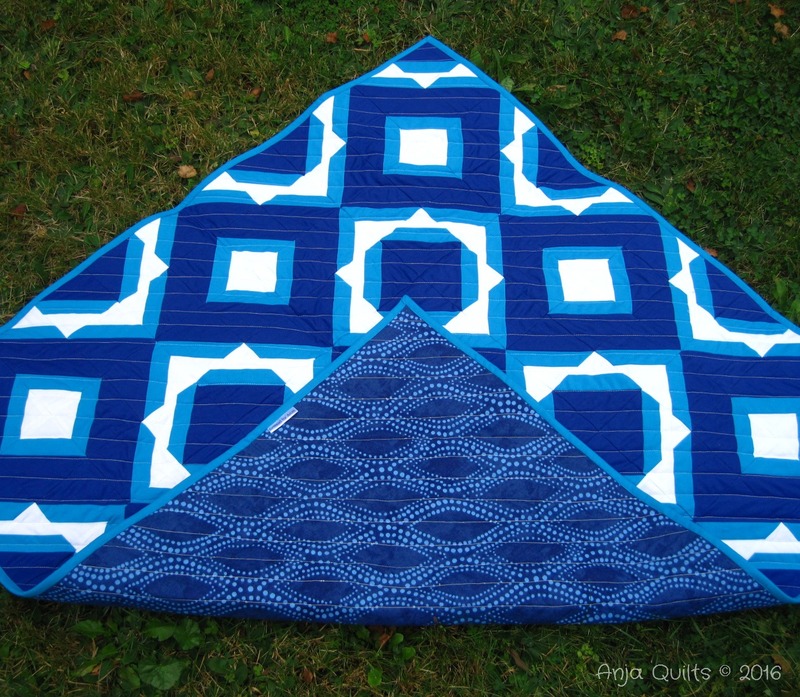 ** If you are not using a flying geese ruler, here are two tutorials to make flying geese units: Traditional Flying Geese Method and No Waste Flying Geese Method. Cut the two teal squares in half diagonally to get four triangles. 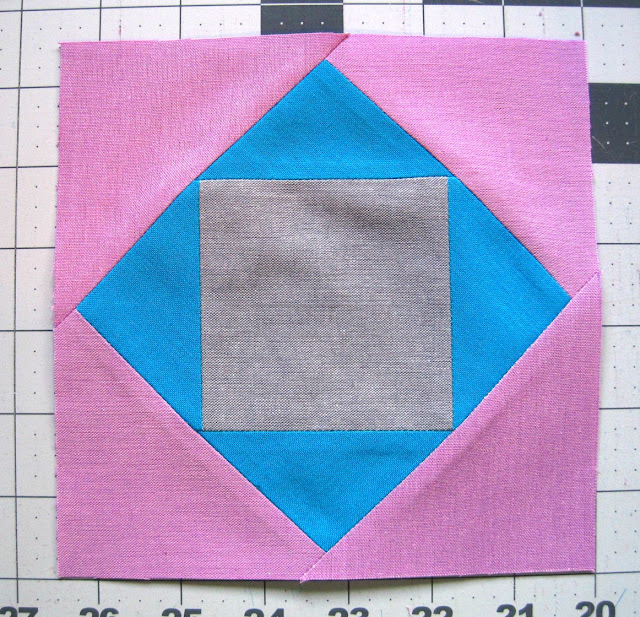 Make a square-in-square block using the grey square. Centre a teal triangle on each side of the grey square. I like to fold and crease both the square and triangles in half so you can accurately match each piece. 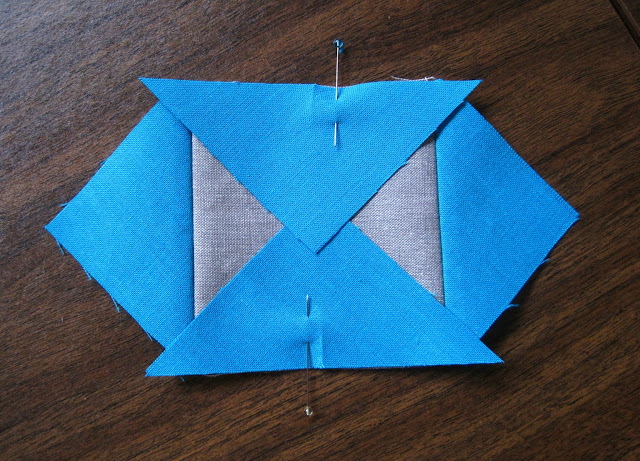 Sew triangles on two opposite sides and press before adding triangles to the other two sides. 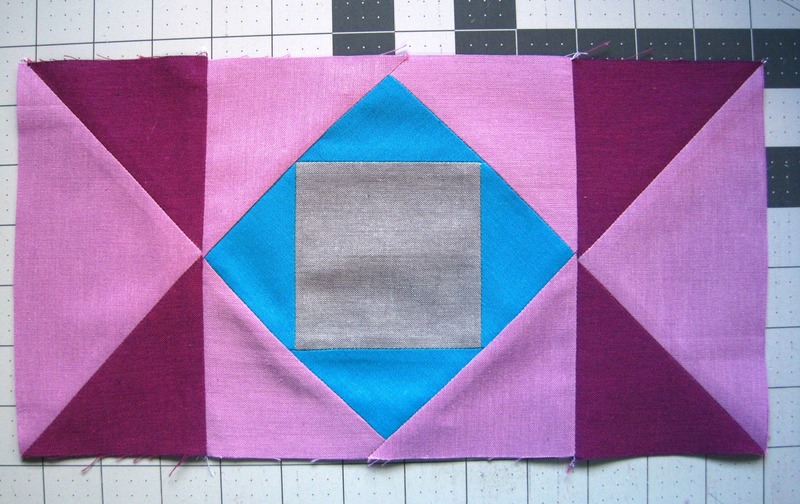 Your block should measure 4 3/4 inches. Cut the two pink 4-inch squares in half diagonally to get four triangles. 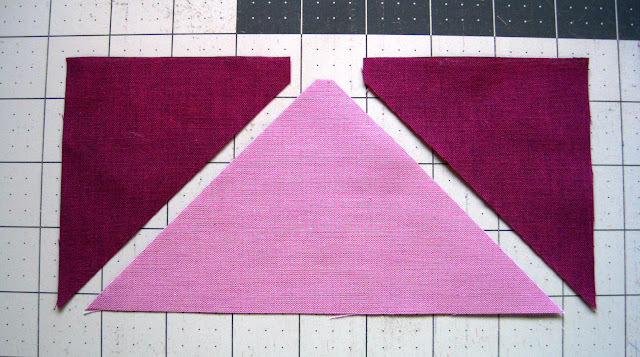 Repeat the steps above to add all four pink triangles to each side of the block. Your block now measures 6.5 inches. Now make four flying geese units. If you are using a flying geese ruler, follow the rulers's instructions to cut the triangles and side triangles. 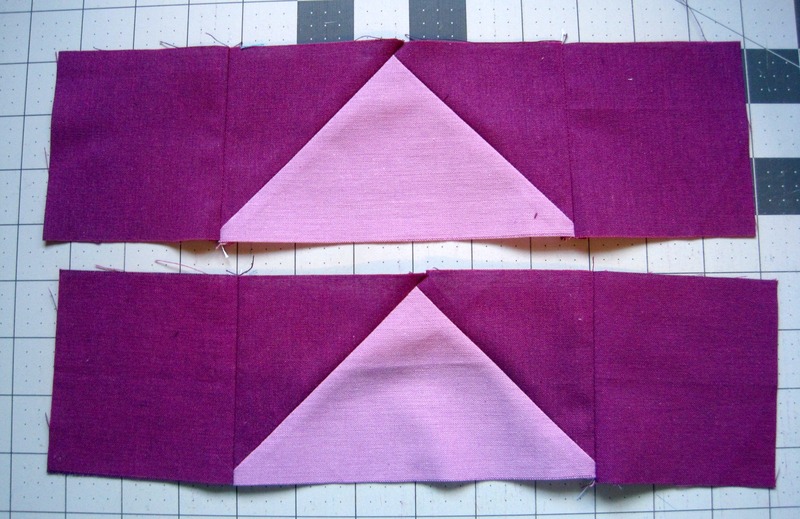 Sew the two side purple triangles to the larger pink triangle. Or follow these tutorials: Traditional Flying Geese Method (you need a 3.5 x 6.5 inch pink rectangle and two 3.5-inch purple squares) and No Waste Flying Geese Method. Make four 3.5 x 6.5 inch flying geese units (to finish at 3 x 6 inches). 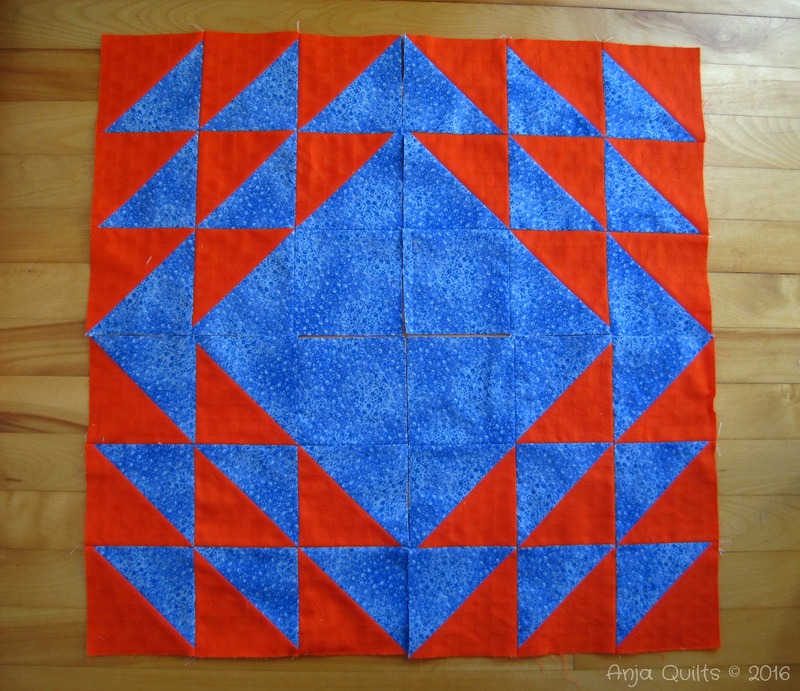 Add a flying geese unit to both sides of the square-in-square block. 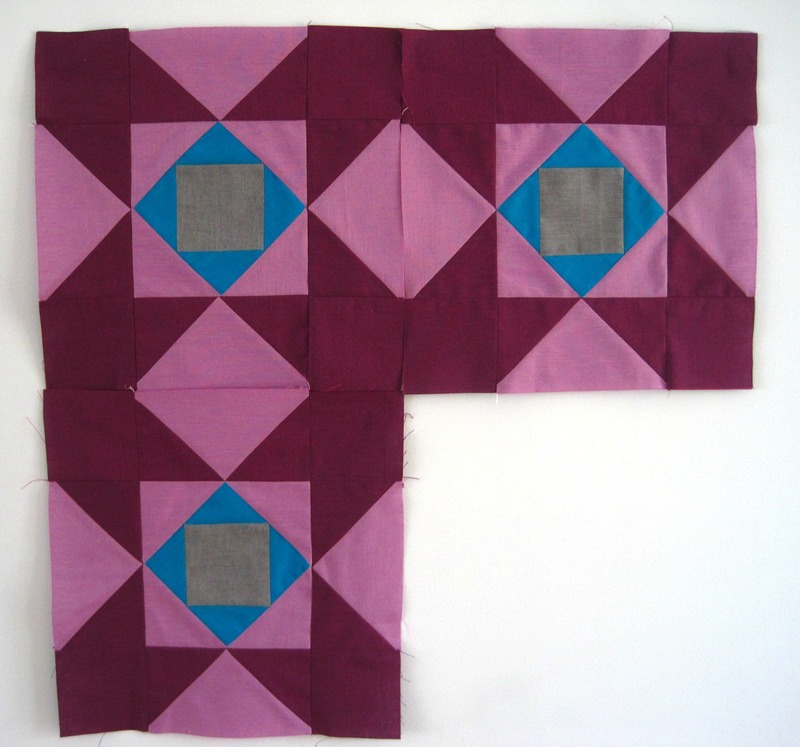 Add a purple square to both ends of the two remaining flying geese units. Add those units to the top and bottom of the block. 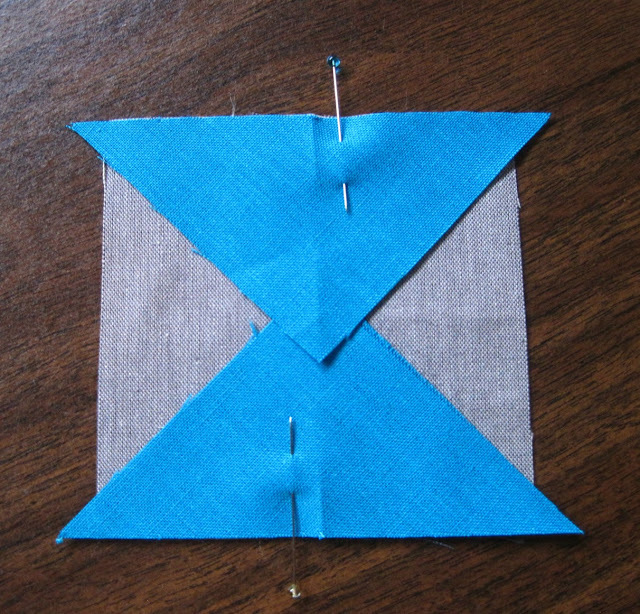 There wasn't enough fabric to make four blocks, but you can see the star pattern that forms when the blocks are joined together. 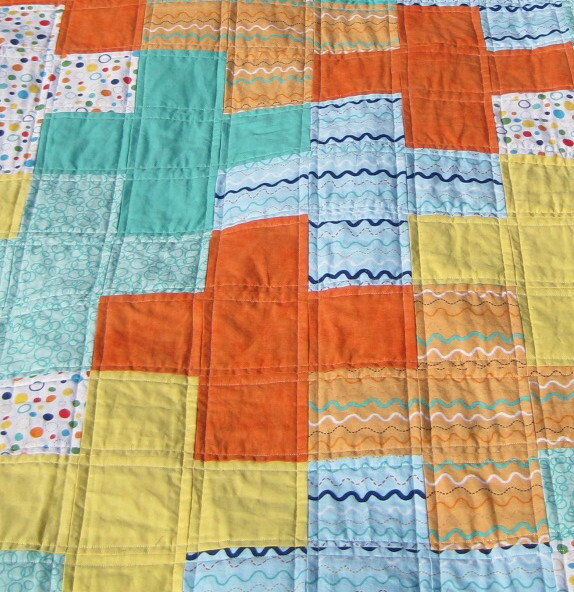 All the blocks made will be sewn into quilts to be donated to charity. 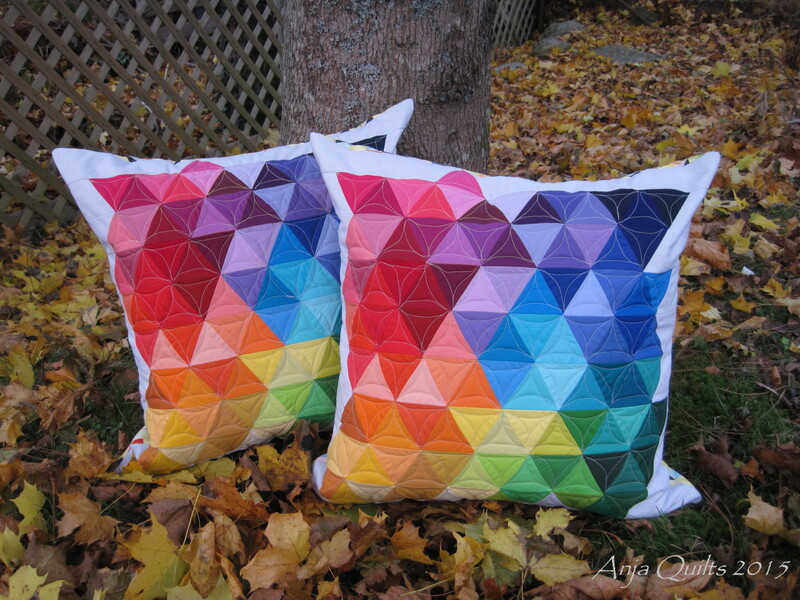 The following blogs are showcasing new block designs today. 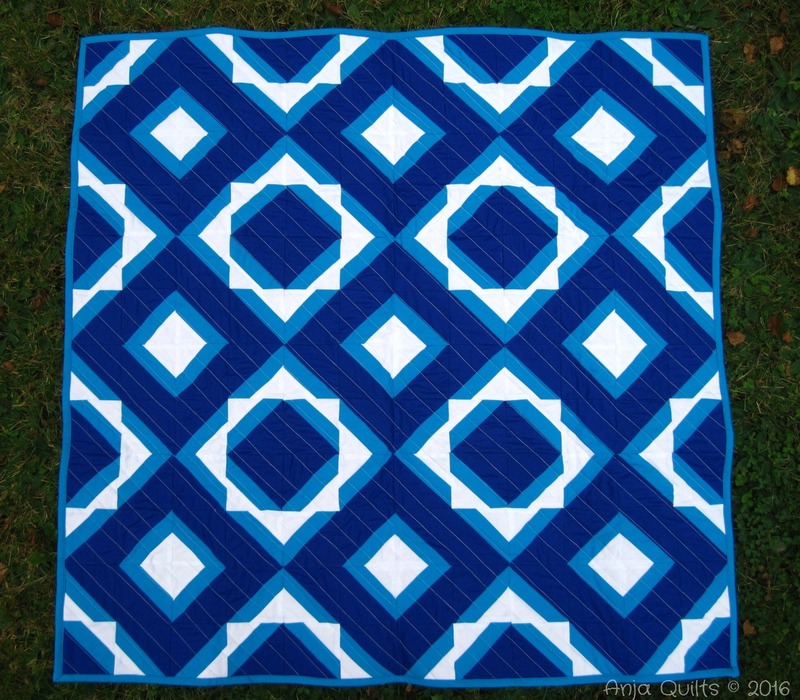 ** Voting is now open for the Maritime Modern Quilt Guild Paint Chip Challenge. My paper pieced project is #16. 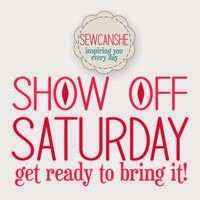 Stop by to see all the wonderful creations and to vote for your favourite project (which I hope is mine). Voting is open until September 24.